Last time I was in Athens I saw a ghost. Well, you expect such experiences in an ancient city, but this shade of a departed friend belonged far away in another country. Yet there he was in an Athenian street. Even with his back turned to me, I knew him instantly. Slight build, skinny legs, T-shirt and long shorts, runners and a baseball cap. Even his gait was the same. Reason was nothing; impulse was all. And so I followed this figure for about three blocks, keeping at a discreet distance. Of course the inevitable happened. The man eventually turned so that I saw his face, and thus realised he was nothing like my friend at all. I felt as if I'd been doused with icy water, even though the returned sweet voice of reason was whispering 'Well, obviously ... ' The same, but not the same. But the whole strange episode set me thinking, and I've now decided that one can be haunted in many ways. For example, conscientious friends have recently sent me bundles of the letters I wrote them decades before. These bundles were almost literally bolts from the blue, and I found myself strangely reluctant to look at them, or even loose the letters from their envelopes. The longer I procrastinated, the more I asked myself why I was doing so, and concluded that memory is another form of haunting: those letters are home to ghosts. I wasn't so reluctant seven years ago. During a visit to Melbourne I watched and waited as my friend Lesley came along the street. Behind her, bearing the weight of three large boxes, toiled her son. Lesley had started writing to me when I was first in Greece, and 30 years later the correspondence was still going strong. But she had decided to return the collection, the letters she had received from me, as it was thus far, and it turned out she had saved everything. The boxes contained a masterpiece of organisation, for every letter, postcard and photo was in its own plastic envelope, and all were in chronological order; there was even a pair of white gloves. "I experienced intimations of mortality at an early age, but of course these are more pressing now, and like Prospero, my every third thought is of the grave." I managed to get the content of the boxes home to Greece, where persistent work ensured that the letters I had received from Lesley were interleaved with mine to her in some sort of chronological order. Soon after, I read approximately five years' worth of correspondence, and then stopped. But I enjoyed the reminiscences, the remembrance of times past, the comments on my own letters, the photos, the bookmarks, the newspaper cuttings we had sent to each other. But now: why the reluctance to revisit the past? One answer to this question is that much has happened in seven years. After all, pseudo science has it that we are quite literally new people at the end of that time: shedding and renewing of skin (not to mention the wrinkling of it), changes in organs, alteration in appearance, and so on. And it goes without saying that the inexorable march of time and the quixotic nature of fate bring other changes. I experienced intimations of mortality at an early age, but of course these are more pressing now, and like Prospero, my every third thought is of the grave. When my grandmother was about 90, she told my mother she didn't want to die. My mother understandably floundered a little. 'But you've always believed in the life everlasting,' she said. 'Oh, I'm not worried about that,' came the reply. 'I just don't want to say goodbye to you all.' I understand this, and old letters remind me that I have already said goodbye to my little boys. It is obvious that I cannot return to what is past and is no more, and I enjoy my life now for all sorts of reasons. But I can still yearn for what I had: the adventure of watching my children grow, the rather egotistical belief that I had souls in my keeping, the deluded idea that I had plenty of time, the precious interludes of my parents' visits. Then there is the question of my essential self. Like the ghost in Athens, I am the same, but not. So I have not read those old letters. But I will. One day. What a brave thing to look back and know your younger self in such detail. I'm afraid I burned all my old letters but didn't regret it. 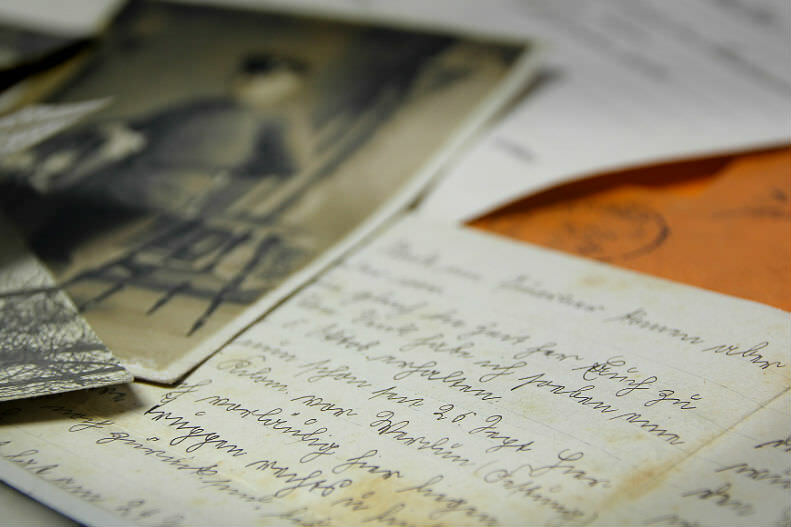 We will have different archives now with our correspondence stored on the cloud. Thanks for your article Gillian. This subject is dear to my heart also and I can understand your interest in old letters; the desire, and sometimes reluctance, to read same. I have always filed interesting or significant old letters. In fact I went to the trouble a few years ago to scan and store electronically, including photographs and in some cases relevant newspaper or other such articles. They now form a part of our family history, this 'hard drive library' held on multiple sites, and extending from last year back to the early/mid 19th century. I do find the best information is always contained in letters; better than pictures, because it is here that people share their thoughts. Of course the original letter in hand is best, but this luxury cannot always be had by all of all families involved. A trip down memory lane is good, and even necessary for people, providing they don't live there. Thank you for this personal and insightful article, Gillian. Your words that your past letters are the home of ghosts particularly resonated. This holds true for any recording of events long passed. Personally I am reticent to watch videos of my kiddies (now 25 and 26!) as infants ...and I have many hours of videos recorded over many years. On a 65inch TV I am transported in time so completely that when the inevitable end arrives I sense a sadness for some time; 'Where are the kids? '', I find myself asking, only to realise these littlies are long gone. So I think not reading the letters is a good idea actually. Knowing they exist, and that that time existed once can bring comfort and warmth. Look at the box and smile. But venturing further can yield sadness and steal our chance to embrace new moments on Earth right now. You certainly got me thinking!! A delicately sensed and beautifully realised contemplation of the intangibles of time and change that leave their imprint on the self and haunt the consciousness - thank you! Even when I was a child, I had a distinct intuition that I had lived previous lives in which I was trying to enlighten others around me. I find most people are not receptive.